We love Ellas Kitchen, it's not only an iconic brand for us in the baby world but one that I trust as we've used it for over three years now. We've tried everything from the baby porridge, right up to their toddler and preschooler snacks - both my boys have always enjoyed anything Ellas Kitchen have to offer. We were fortunate enough to work with Ellas Kitchen when Noah was one, and of course I was delighted when they got in touch to ask Patrick to be one of their 'Tiny Tasters'. This meant he got to sample their delicious new pouches and boy were they a treat for his taste buds. Ellas Kitchen have brought out a new fantastic 'Love Veg' range, as you can imagine, the ingredients are centred around vegetables which are great for first tastes as it helps your little one lean more towards savoury as opposed to sweet. Their flavours include a delicious carrot, peas and kale which Patrick absolutely devoured on our picnic this week. A pumpkin, broccoli and sweetcorn as well as a squash, sweet potato and parsnip. All of these were huge hits with my boy, as Patrick is now on a much lumpier texture, we found these fantastic to use in his meals such as pasta, adding the pouch as the sauce. It was a sure fire way to know he was getting his vegetables and it meant a little less preparation for me in the evenings, which was definitely welcomed now I am back at work. All of the new Love Veg range is suitable for vegetarians, as well as being dairy, soya and nut free - perfect for little ones with an intolerance. All ingredients are organic, meaning your little one is only filling their tiny tummies with what's best. Pouches for me are incredibly handy and I always like to have a little stock pile in the cupboard just in case we need to head out for the day and I don't have anything prepared. Sometimes, the unexpected happens, just last week I had to collect Patrick early from nursery as he wasn't 100%, dinnertime was minutes away and I hadn't defrosted any of his purees. We all know that a hungry baby is a force to be reckoned with, but when I'm reaching for Ellas Kitchen I don't feel guilty, I know they're feeding him well and giving him the nutrients he needs. *We were sent these as part of our role as a tiny taster. 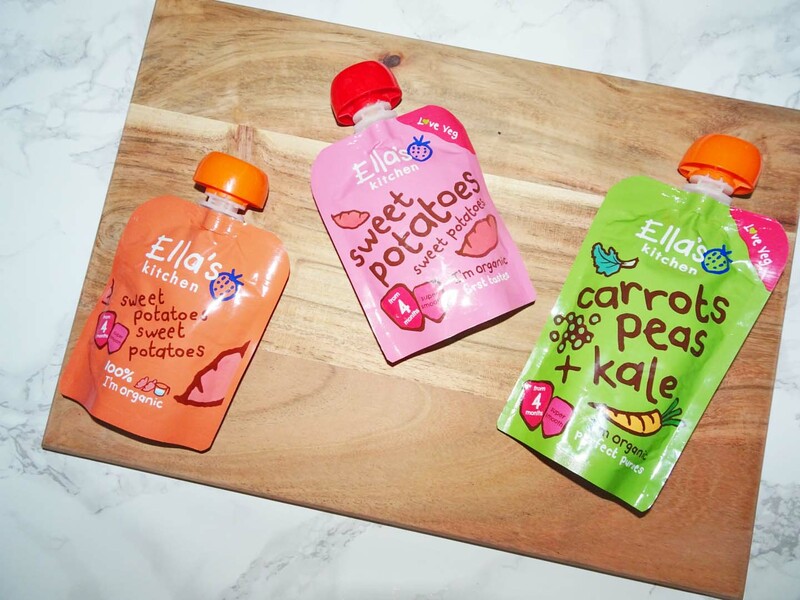 We used Ellas Kitchen pouches when my daughter was little. They seem like a relatively healthy choice if not doing homemade and they are tasty! I liked them lol! I love Ella's kitchemn, it was the only brand Leanor would eat. I am so glad that they have brought out this fab new range, even though Leanora is now 3, she still likes quite a bit of the older treats.